We have had a couple of yard trips out to try and get everyone qualified for the Winters. We went to Aldham Mill on 30th September, it was mainly successful with our newcomer to the yard Elli Darling winning both Novice classes on Fitz (Fix Up, Look Sharp) with brilliant scores of 71.66 and 70.96 + a H&H write up! And also winning the Medium with Chunky (Don Karibia) on 64.4%. Pip Corbett riding Julie Lockey’s ‘Reg’ had a consistent day getting 2nd with 65% in the Ad Med and 3rd in the A100 with 65.62%. Gen Walters was very pleased with Elaine Hack’s Always Owen winning the Ad Med with 66.57% and gaining 63.12% in his first A100. Diane Vardey had a mixed day with her own Nico getting 2nd with 67.93 in the first Elementary and then being spooky and tense in the second test. Josie and Troy won the A100 with a very good score of 68.43% so was very pleased and Kelly came 2nd on Jordas with 66.87%. Susan Riley had a good day competing Jordas for the first time in the Ad Med and will hopefully be out again soon! Moving on to Vale View on 14th Oct, again was a good day for all with Kelly winning the first Novice with 74.58% on her own Chaim T (Slim!) and then getting 67.1% for 3rd place in the second test in a different arena which had a piece of very scary material stuck to the wall so was a little tense! Elli rode Tori Bahl’s Don Karibia in Both Medium tests to gain 63.03 and 64.71 which was slightly disappointing as Elli felt the second test was considerably better than the first. Becky competed Josies Don Angelo in the Ad Med to win on 70.53% and then in his first Advanced to also win that with 70.88% – he is definately one to watch! 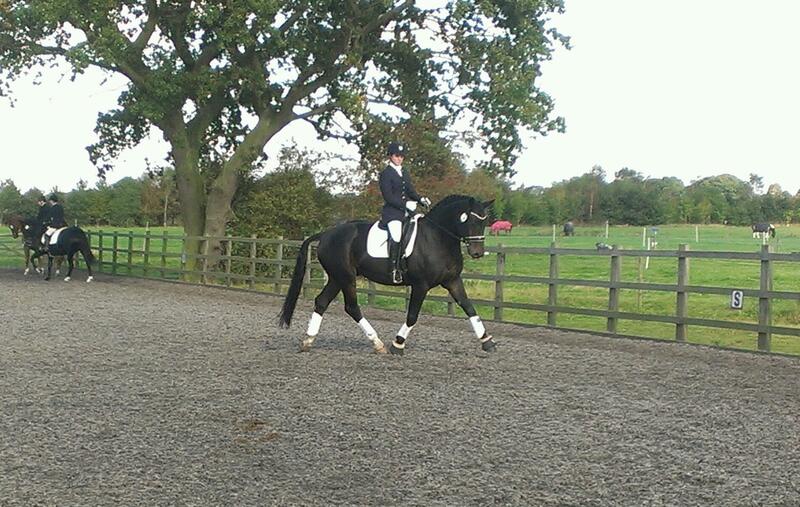 Kirsty Mellor had a good day competing Kwadraat to get 68.82 in the Advanced class and 2nd place. Next Post Caluna is Famous!